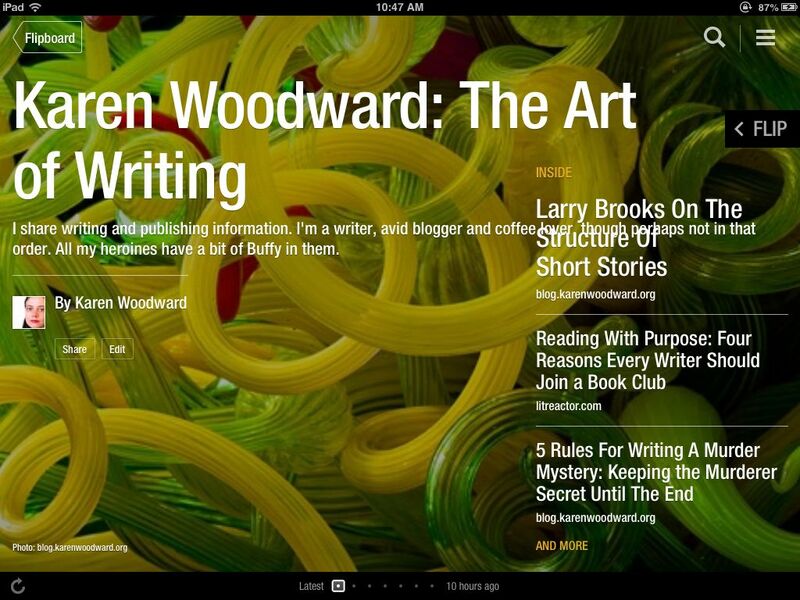 Karen Woodward: Publish Your Own Magazine On Flipboard! Magazines can incorporate content from virtually any source, including your website, blog, RSS feed and anything you share on social networks like Facebook, Twitter, Instagram, SoundCloud, LinkedIn and Tumblr. 2) Go to share.flipboard.com and install the 'Flip it' bookmarklet. The bookmarklet will allow you to add content to your magazines directly from your web browser. 3) Start browsing the web, and when you find something you want to add to your magazine click the 'Flip it' button. You'll be prompted to login the first time. 4) Click 'Create a magazine', then customize it by adding a name and description, and simply start adding content. You can also easily create a magazine from within the app. Once done, check out your magazine on Flipboard, where you'll see your “flipped” items in a print-style layout. You can also tap into any item and promote it to the cover. You can keep track of your magazine's popularity via it's cover. There you'll see it's number of Readers (Subscribers) and Page Flips. You'll also get notifications in the app when people like, comment or subscribe to your magazines - so be sure to check. You can tell people about your magazine by clicking the “share” button on the cover. You'll be able to post a custom link to Facebook and Twitter or have it sent via email. I set up a magazine to test out Flipboard's new functionality and published some of my most viewed posts to it, along with a scattering of articles from my Twitter feed. It's here: Karen Woodward: The Art of Writing. For those of you unfamiliar with Flipboard, it is the Swiss Army Knife of social media aggregators. It is also the Vogue of aggregators since it has a beautiful, magazine-like, interface. In order to view Flipboard you need to download the app. You can get it here: Flipboard app. Photo credit: Karen Woodward: The Art of Writing. Hi Ellen, thanks for mentioning paper.li. That's interesting. Yes, from what I can tell, much more control. "... it's very hard to subscribe to a blog in either of those apps"
Hi Jannik, thanks for your comment. I know what you mean, for blog reading I prefer Feedly.